This project was a 6,000 square-foot addition to and a 5,000 square-foot renovation of an existing, considerably aged, multi-use structure into a two story radio broadcast station. Specific challenges included building on a small and steep site, merging new structural steel and concrete to the existing wood structure, and modernizing the out of date electrical and HVAC systems of the building, all while avoiding disturbance to the adjacent two residences. 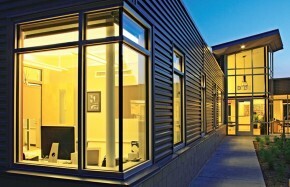 The unique architecture showcases the natural light streaming throughout the building.